Putters need new grips from time to time just like other clubs. Golf grips are like tires on a car. The more worn they get, the less effective they are. Independent studies suggest that a person who plays 18 holes of golf a week should change out his grips at least once a season. While a putter doesn't necessarily have the same swing force as a driver or one of your irons, it's still vital that you have the grip changed when it begins to wears down, if for no other reason than to restore the touch of the putter. You change a putter grip in basically the same fashion as you would any other club in your bag, with the only difference being a greater attention to detail on lining up the grip. Place the shaft of the putter in the vise. You'll want 2 to 3 inches of clearance between the vise and the end of the grip. The club should sit vertically in the vise so that the putter head is pointing up. Cut and remove the old grip. Use the razor knife to slice from the bottom of the grip all the way to the top. Scrape off the old tape with the razor knife. Your putter may not have ever had the grip changed, so taking off the old tape is just part of cleaning the shaft for regripping. Remove the leftover tape pieces and any remaining glue using a lint-free rag or towel and mineral spirits. You want to get the shaft as clean as possible for the application of new grip tape. Place the new grip next to the shaft to determine how far down the shaft you want the tape to go. Apply the new tape. There are two types of tape that can be used for grips. 3/4-inch tape needs to be wrapped around in spirals from the top down, while 2-inch tape needs to be cut to the right length for the grip, affixed vertically down the shaft and then applied around the shaft with your fingers. Leave a 1/2-inch space on the end when using 2-inch tape. Twist the 1/2-inch tape extension and push it into the hole on the end of the putter shaft (this only applies when using 2-inch tape). This will create a watertight seal on the end of the shaft. Apply liberal amounts of mineral spirits to both the inside of the grip and the retaped shaft of the putter. Put your finger over the hole in the end of the grip to keep the mineral spirits from running out. Dump the mineral spirits inside the grip onto the shaft, which only serves to add more solvent to the shaft. Line up the grip lines as close as you can to true. This will make for less work once the grip is on the shaft. Slip the end of the grip just over the shaft and, with a very quick movement, slide the grip completely on to the shaft. Check your putter grip lines to see if they are lined up down the shaft. You may have to twist the grip slightly to get the lines perfect. 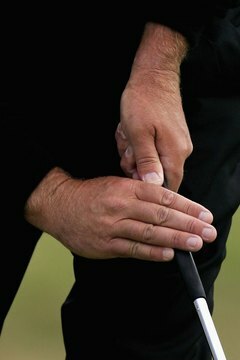 Pop the end of the grip with the palm of your hand to make sure the grip is on tight. Allow the grip two to four hours to dry before using your putter.